2016-W American Platinum Eagle: How Does Quick Sellout Impact Aftermarket? 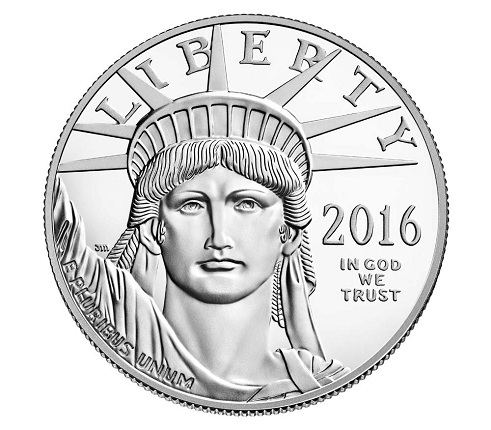 On May 26, as collectors waited to find out when the 2016-W Centennial Gold Standing Liberty Quarter and other highly-anticipated issues will launch this year, the Mint surprised everyone by announcing that the 2016-W $100 American Platinum Eagle Proof coin would be released on June 30. Last year’s release in this popular series was not available until last December due to problems sourcing sufficient supplies of platinum planchets. But this year the Mint reported having fewer problems in that regard, though it is still not clear if there will be no one-ounce bullion coin for the second year in a row. The 2016-W platinum Proof coin is the second coin in the Mint’s two-year series, Torches of Liberty, which is a bridge between the previous multi-year series, Preamble to Constitution, and the next one, believed to be on the Bill of Rights, that starts in 2018. A 10th anniversary coin will be issued next year using the original bullion coin design. “Torches of Liberty”: 2015-W American Eagle Platinum Proof Coin reverse (left) and 2016-W American Eagle Platinum Proof Coin reverse (right). 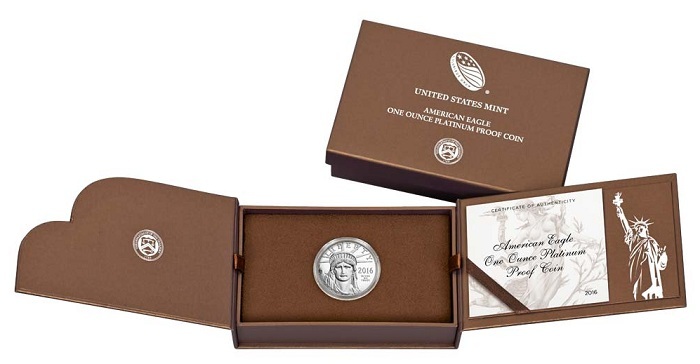 The theme of the 2015-2016 series features the American values of liberty and freedom, and both coins were issued with a special presentation box that can be used to display the set. Each includes neo-classical renditions of Lady Liberty on their reverses and the same obverse used on every coin in the series that depicts a close-up profile of the Statue of Liberty. 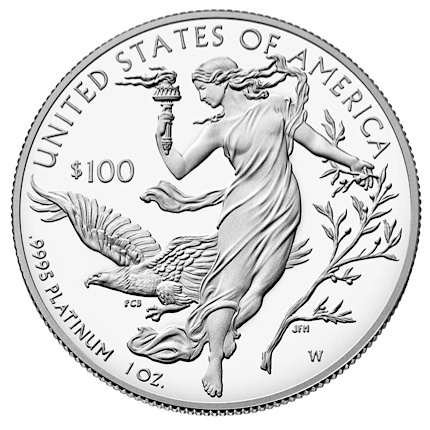 The 2016-W coin’s reverse shows Liberty in a flowing gown with the torch of enlightenment in her right hand and an olive branch in her left hand, plus a bald eagle with its wings outstretched next to Liberty. It was designed by Paul C. Balan of the Mint’s artistic infusion program and engraved by Joseph Menna. The obverse is the handiwork of John Mercanti, who was the 12th chief engraver at the Mint. In addition, compared to several years ago, when the price of platinum plus the premium charged by the Mint meant a cost of about $2,000 per coin, the new issue debuted at a more affordable $1,350. The coin carries a maximum authorized mintage of 10,000 coins, whereas last year’s had an unusually low mintage of 4,000 coins (actual sales were 3,886 coins) because of the planchet shortage, which caused it to sell out in about seven minutes. Both issues had a household limit of one coin. Most collectors did not expect a quick sell-out of the 2016-W coin, especially given the 10,000 maximum mintage and the recent trend of declining sales for the series. Despite relatively low issue prices compared to earlier coins in the series because of lower platinum prices, sales of these coins have been going steadily downwards for the past couple of years. In 2014, there were sales of 4,629 Proof coins, and in 2013 sales were 5,746 for the Proof coin. For a list of mintages for the entire series, see this article. Prior to the launch of the coin, some dealers — including Barry Stuppler and Co., Pinehurst Coin Exchange, Penn Metals, and others — each offered a premium per coin of about $100 to sellers who were interested in making a quick profit. Stuppler offered some additional incentives to those who could supply multiple coins. For the first four coins, sellers were offered $100 profit on each, and for the fifth the amount was increased to $250, or they could upgrade to a graded Proof 70 coin at no charge. These dealers clearly expected solid demand for the coin, based in part on last year’s instant sell-out. As always, a large part of the demand for these coins will be for examples that have been graded Proof 70 by NGC and PCGS. Just before the coin went on sale at the Mint, Modern Coin Mart had the coins listed for sale for $1,549 for Proof 69 coins, $1,749 for NGC 70s’, and $1,895 for PCGS 70’s. Early indications based on order numbers suggested that the coin was selling briskly on June 30, and an early sell-out appeared possible. At 12:56 pm the coin became unavailable on the Mint’s web site, which did not necessarily mean it sold out, but rather that the Mint exhausted supplies of coins that were struck in advance of the release. What was not known at the time was how many coins were ready at the launch. On July 1, the Mint announced that it had received orders “totaling the entire mintage” and that after the order reconciliation process is completed to account for cancellations, credit card problems, etc., some additional coins may become available. The fact the coin sold as well as did despite the high maximum mintage, and given that the Nancy Reagan gold coins were scheduled to be released the following day, certainly indicated a high level of interest in the coin. Not many coins at this price point sell out of their entire mintage right away. And the fact that orders for the coin began processing and shipping immediately suggests that the full mintage was indeed struck in advance of the launch, though Mint officials were not able to confirm that. Early prices on eBay were all over the map, with sales varying on June 30 between $1,475 and $1,825. Retail prices from coin dealers settled in at $1,550-$1,600 for ungraded and Proof 69 coins, between $1,700 and $1,800 for Proof 70 examples graded by NGC, and around $1,900 for those graded 70 by PCGS. EBay prices in the days following the release mostly paralleled retail prices. In addition, premiums being offered to buyers on coin forums and message boards by potential sellers looking for inventory of this issue began to drop by July 1, in spite of the fast sell-out. Considering that previous coins in the series are not offered for sale very often, it does appear that there is a core of collectors who buy to hold, but without question a large portion of sales went to dealers looking to sell primarily graded coins and flippers looking for a quick profit, especially after what happened with last year’s platinum Proof. As far as aftermarket potential, those interested in short-term gains will do best with 70-graded pieces. It appears this is one of those coins that may have better long than short-term potential. That is the case in light of the strong past performance of many coins in the series; the fact that platinum prices* are rising and have historically been higher than those of gold (rather than around a 30% discount to gold, as they are now); and the fact that there is such a consensus regarding the coin’s appealing and inspiring artwork. To better understand the market for this issue and where its value may be headed, I reached out to Modern Coin Mart, a major dealer that is a market maker in modern U.S. Mint coins. MCM’s Andrew Salzberg, who is general manager of the company, provided a candid overview of his thinking about this coin and its aftermarket potential. Mr. Salzberg began by saying some of his customers told him that MCM’s pre-order pricing for graded examples of the coin seemed to be on the low side, setting a price ceiling for the coin in the view of some coin forum posters. He said he disagreed and that many people were too focused on the performance of last year’s coin, which had such a low mintage. The 2016 issue, as he said, has a mintage 2.5 times higher, so it would be unrealistic to expect it to become a $3,000-plus coin like the 2015 issue. So he set prices at a level at which he believed they would end up after any kind of temporary frenzy due to the fast sell-out. He also noted that the success of last year’s coin might add to the demand for the 2016 piece, especially since they form a set, but he pointed out that the quick sellout of the entire 10,000 mintage of the new issue was driven much more by speculators than by collectors. Mr. Salzberg also stressed that he really likes the platinum series, including especially the Proofs and the burnished coins from 2006 to 2008, which he believes offer “great value and are fantastic coins.” He also said that the 2016 Proof “is a beautiful coin,” which he thinks should maintain its current premium going forward. The 2016-W platinum proof coin does not seem to be a rare standout release like the 2009 Ultra High Relief $20 gold coin, or last year’s platinum Proof, because it is not a low-mintage issue, nor is it likely to elicit the same demand as those coins in the future. But the coin still has a lot going for it, such as its popular design and the fact that it is needed for the two-year set, and it should maintain a solid premium going forward, especially if platinum continues its upward momentum. Its quick sell-out may not be a very good indicator of how much actual collector-demand exists for the coin, but it still should help support the coin’s value over time. *Spot platinum prices continued rising while the 2016-w platinum coin was launched and reached $1,065 on July 1. Louis Golino is an award-winning numismatic journalist and writer specializing on modern U.S. and world coins. His work has appeared in Coin World, Coin Week, and the Numismatist, among other publications. His first coin writing position was with Coin Update. Louis, Thank you for your article. 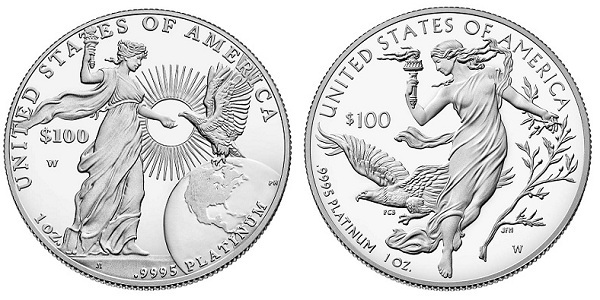 If, indeed, there will be no bullion one-ounce platinum coins for the second year in a row, then the 2016-W Platinum Proof Eagles may become more valuable although not as valuable as the 2015-W Platinum Proof Eagles. During the years 2009 through 2013, there were no platinum bullion coins although there were only platinum proof one-ounce coins. The 2011-W Platinum Proof debut price was the most expensive @ $2,092. “Some” dealers were recruiting customers with a $100 over costs offer to buy and turn over. (I got an email, but missed out). It sounds like silvertowne was up to no good again. Il tell you,ever since the Chicago Ana show where they paid everyone they could find to stand in line and buy out the supply… I as a 100 percent disabled vet who cannot stand and walk very well WAS PISSED tohave a friend and I drive all the way there only to be shut out as a collector. That was the last time I will drive over an hour to a coin show.